As a physiotherapist, a mom and a teacher, I offer up a silent thank you almost every single day to the ingenious person who came up with the idea of entertaining children with bubbles. There are so many incredible benefits for both bubble-blower and bubble-popper from this simple soapy solution. It doesn’t break the bank or take extensive preparation, and with a little bit of practice, you can soon hone your bubble blowing skills. You will be able to blow bubbles either one at a time or many all at once much to the delight of your little one. Bubble blowing is also such a versatile activity. It can be played indoors or outdoors, and is enjoyed with or without friends. The number of different bubble blowing toys that are currently available on the market attests to what a win this activity can be. Including a variety of bubble blowing devices to your repertoire can also add to your child’s levels of excitement. There are the usual bubble bottles with a mini wand inside, but there are also giant wands, wands with multiple holes, bubble guns, bubble machines, scented bubble solutions, glycerine bubbles that don’t pop so quickly, and the list goes on. I even keep a tiny bottle of bubbles in my handbag for those desperate occasions where tensions are high, and kids need entertainment and distraction. Bubbles are a fun way to help develop visual skills. Because bubbles are eye-catching and slow moving they are a great way to help your little one learn to use her eyes to fix, focus and track, thus developing vital visual tracking skills that are needed at a later stage, especially in school. Bubbles are a great distraction during tummy time, and every bit of tummy time helps with your little one’s development. When in this position, bubbles also encourage your baby to turn its head up and down and to both sides, which are movements that are needed to help control primitive reflexes. This is so important for future smooth, coordinated movement and learning. Once your little one gets stronger on his tummy, he will start to reach out for the bubbles. There is a ton of muscle strengthening and balance development going on as he attempts this. Bubbles provide motivation to move. As your developing baby starts to crawl, creep and cruise he will love chasing after bubbles. Crawling over, under or through obstacles to get to bubbles is a great way to encourage body and space awareness and problem-solving for your baby. When your little one is learning to stand and walk independently, bubbles provide many opportunities to work on developing balance reactions as he moves after the bubbles. There is a lot of starting, stopping, changing direction, shifting weight, reaching up and squatting up and down. What an awesome workout! Once your little one is able to grasp the wand, he will also want to help create the magic of bubbles. Warning - it will get messy, but practice makes perfect. Being able to grasp, hold and manipulate the wand in and out of the container helps the development of fine motor control, which is so important for the development of the correct pencil grip, writing and working with tools in the future. Let both hands have a turn. Popping bubbles, be it with the whole hand, two hands, a finger, a foot, a toe all helps the development of hand-eye or foot-eye coordination. These early movement experiences form the basic building blocks of catching, hitting, throwing and kicking skills involved in ball sports. Help your toddler to learn how to blow the bubbles themselves. This activity is usually learned between the ages of 2 and 3 years. Blowing is a fantastic way to develop the muscles of the jaw and mouth and is used fairly often in therapy to help with kids that drool or dribble a lot, as it increases the muscle tone around the mouth and helps young children to be able to elicit different sounds of speech. It is not as easy as it seems and may take a while for them to figure it all out. Sucking in, instead of blowing out, is quite a common starting point, but they will eventually get the hang of it. Can you pop one with your nose? Developing an awareness of how their body can move in space and understanding directional concepts develops alongside body awareness. Bubble play can encourage the understanding of concepts such as up / down, over / under, in front / behind, next to, above / below. Bubbles are a wonderful social tool for groups, like siblings, baby friends or a baby/toddler stimulation class. In groups, children further develop body and space awareness as they learn to move around and pop the bubbles without bumping into each other. Whether actively interacting or simply lying down and watching them float around, bubbles are a magnificent and magical way to help development and enjoy the moment. When you are feeling tense or anxious, the wonderful thing about blowing bubbles for your child is that you too can benefit from blowing bubbles. Taking deep breaths and steadying the flow and direction of your outward breath is a wonderful calming tool, along with the visual effect of watching floaty bubbles drifting slowly through the air. It’s a win-win situation for bubble blower and bubble popper alike. When head control is still developing between birth to around four months, it is a lovely idea to introduce bubble play while your baby is lying supported on their back, so that they can try to fix and focus on the bubble and track it as it moves slowly by their face. Try this again in supported tummy time by placing a rolled towel or cushion under your baby’s chest to help it lift its head. When your baby has enough head control to be on their tummy and supported on their elbows, usually from between 3-5 months onwards, place a shallow pan of water in front of them and blow bubbles onto the pan. The bubbles will stay on the water for a short while before popping. Blow these around gently. You can also place some bubble liquid in the water and blow through a straw to create a growing mountain of bubbles. 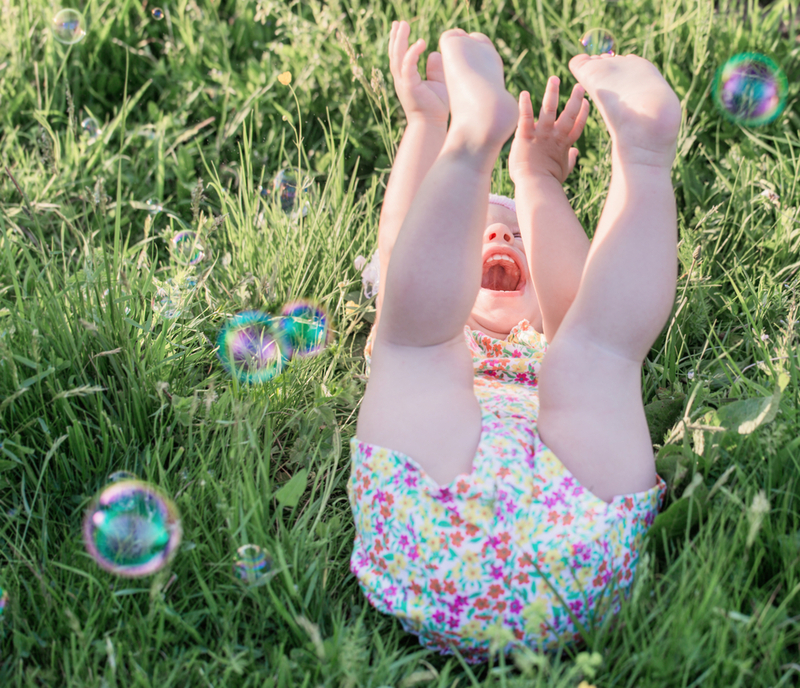 When your baby is starting to sit, around 5-7 months, try to blow individual bubbles towards them and encourage them to reach out with one hand or to pop the bubbles with two hands to encourage clapping in the midline and training their balance in sitting. When your older baby can pull up to stand and be in supported standing, encourage him to watch the bubbles fall to the ground. Try catching a bubble on your wand then let your baby reach to pop it. He’ll be able to do this before he develops the ability to reach out and pop a moving bubble. When sitting, be it leaning against you, independently on the floor or in the high chair, encourage pointing to the bubbles, which leads to grabbing, then catching and finally popping them with a clap. Once able to crawl, creep and walk, your older baby will love to chase after bubbles and pop them in the air or on the floor. Safely arrange obstacles for your crawler or toddler to move over or under to get to the bubbles, for example; cushions, pillows, tunnels and chairs. Bubbles are great fun at bath time. They will sit on wet skin for longer before popping. Blow the bubbles onto your little one’s body and name the body parts they land on. Older babies and toddlers love trying to hit bubbles with a fly swatter. Start with bubbles that land on the ground and progress to those bubbles still floating in the air. Can you imagine a more simple, cost-effective, yet highly entertaining way to stimulate your baby or toddler’s development? It really doesn’t get easier than this.